Cynthia Last. 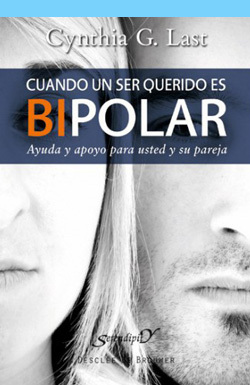 Cuando un ser querido es bipolar: ayuda y apoyo para usted y su pareja. Bilbao: Desclée De Brouwer, 2012, 374 pages. Translated by Marta Pino Moreno. ISBN: 978-8433025319. Spanish translation of the original title: Cynthia Last. When Someone You Love is Bipolar: Help and Support for You and Your Partner. Guilford Press, 2009. Published in Spanish by Desclée De Brouwer.